← What is a Community? Adaptive management (AM) is one of those terms that you often see used in Environmental Assessments (EAs) and other environmental projects that require long-term planning and monitoring. So what exactly does it mean for resource managers and environmental assessment practitioners? “Adaptive management is a systematic process for continually improving management policies and practices by learning from the outcomes of operational programs. 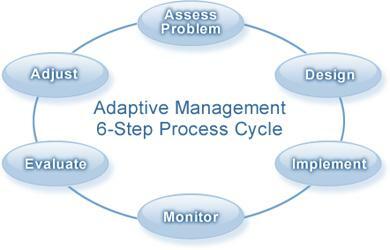 Its most effective form–”active” adaptive management–employs management programs that are designed to experimentally compare selected policies or practices, by evaluating alternative hypotheses about the system being managed.” (BC Ministry of Forests, Lands and Natural Resources Operations, 2011). Within an AM approach there is an explicit acknowledgement of uncertainties and knowledge gaps about the response of the system to management actions. Reducing these uncertainties (e.g. learning) becomes one objective of management. It should be noted that AM is a deliberate process, not ad-hoc or simply reactionary. However, flexibility in the approach is important to allow the creativity that is crucial to dealing with uncertainty and change. AM is a unique tool that is being adopted by various levels of government. In regards to AM and Federal EA processes in Canada, there is recognition that all EAs involve some level of uncertainty regarding the identification of environmental effects, the assessment of their significance and the effectiveness of mitigation measures. The Canadian Environmental Assessment Act implicitly recognizes uncertainty by requiring a follow-up program for all projects that undergo an assessment by comprehensive study or a review panel. In response to data generated by the follow-up program or monitoring, the proponent, the responsible authority or the regulated authority is required to initiate adaptive management measures if mitigation is not adequate to eliminate, reduce or control adverse environmental effects. This entry was posted in Management and tagged communication, consultation, environmental assessment, government, management, project management, stakeholders. Bookmark the permalink.